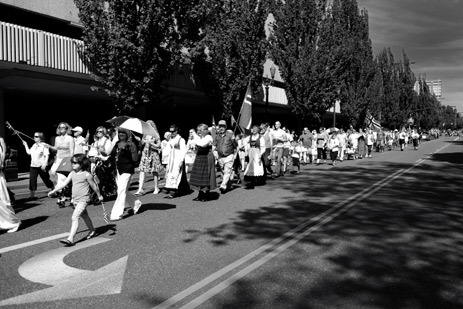 This celebration is sponsored by Sons of Norway’s Grieg Lodge at its historic Norse Hall on 11th Ave and Couch Street in NE Portland. The doors (and the Oslo Lounge) will open at 4 pm on Friday, May 17th, and this is an excellent time to introduce your friends and neighbors to the rich and unique Norwegian culture. Socialize, enjoy ethnic food in our dining room, and shop for Nordic treasures and flags in our Landhandel. MENU: Open-faced shrimp sandwiches; carmelized onions, surkål and pølse with lompe or bun; rømmegrøt; dessert cakes; coffee, tea and sodas — all available for purchase in the Bergen Waterfront dining room. Complimentary hot dogs, bottled water and ice cream for children 10 years old and under. 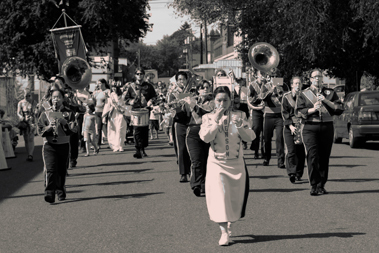 THE DA VINCI ARTS MIDDLE SCHOOL BAND AND CHILDREN’S ACTIVITIES: Band performing outside the Hall from 5 pm, with a rally at 6 pm — an opportunity for all to cheer for 17. Mai and to sing “Ja, vi elsker.” Upstairs in the Lodge Room there will be assorted children’s activities, with the Benson High Robotics Club from 4 pm, as well as crafts offered by the Lucia Court; and, at 5 pm in the Grand Ballroom, interactive Leikarringen folk dancing. CULTURAL PROGRAM: Held in the Grand Ballroom, starting at 6:30 pm, featuring speakers, the Scandinavian Chorus and other music. EVERYONE IS MOST WELCOME! Alle er hjertelig velkommen! As in Norway, national costumes and festive attire are encouraged—Vi sees i bunader of 17. Mai stas! At the beginning of 1814, Norway was a separate kingdom united with Denmark under King Frederik VI. Because he was involved in war on the side of Napoleon, the Allied Nations forced Frederik to cede Norway to Sweden by the Treaty of Kiel, January 14, 1814. Led by Crown Prince Christian Frederik, the Norwegians refused to be handed over to Sweden and her Crown Prince, Carl Johan. Declaring to be an independent country, a Constituent Assembly met at Eidsvoll from April10 until it completed a constitution signed on the 17th of May. Christian Frederik was elected king. Failing to get support from Britain, Norway engaged Sweden in a brief, but futile war, which ended on August 14, with the Convention of Moss. Allowed to retain her Constitution, with some modifications, Norway joined Sweden in a personal union until 1905 when she became a fully independent nation with her own king, Haakon VII. His son, Olav V, reigned until January 1991, when the third monarch of modern Norway, King Harald V, ascended to the throne of a free and independent country. 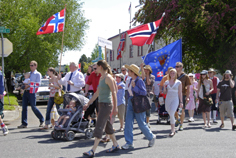 When Norwegians emigrated, they brought with them their love for the Constitution and the traditions of May 17. Celebrated around the world, the day marks a commemoration of independence, freedom and the second oldest written constitution in the world.